G.I. 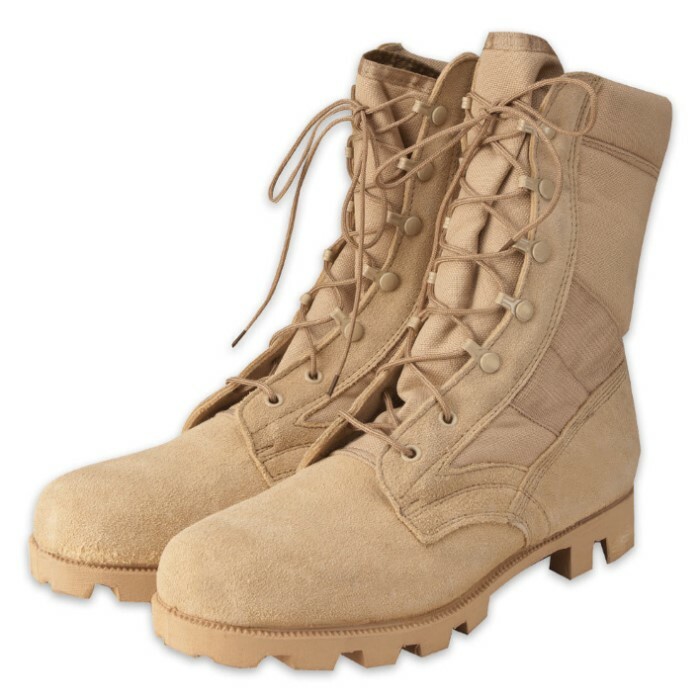 Type Desert Tan Speedlace Jungle Boots | BUDK.com - Knives & Swords At The Lowest Prices! Heavy-duty rubber "Panama" soles and heels are vulcanized to the Cordura and suede uppers and have a padded collar and a removable cushion insole. The side vents let out heat and moisture while the steel shank gives you support and protection. i have a pair of these boots. my girlfriend bought them for me because i had been wanting them. anyway.. initial thoughts when i pulled em out of the box they looked awesome. better looking in person than in picture.the panama sole is very agressive looking. very soft rubber very grippy. tried em on, felt great. may want to order a size down bc they run a little large to allow for foot swelling. anyway comfortable as can be.. very thin insole though. a good gel insole and theyll feel awesome. very comfortable. been wearing on and off for bout a week so far and i love em. ready to give them an endurance test. i sprayed some never wet on them and it made em a lil white.. but now theyre inpenetrible to water so maybe theyll last longer.. anyway based on initial testing.. would recommend to anyone!